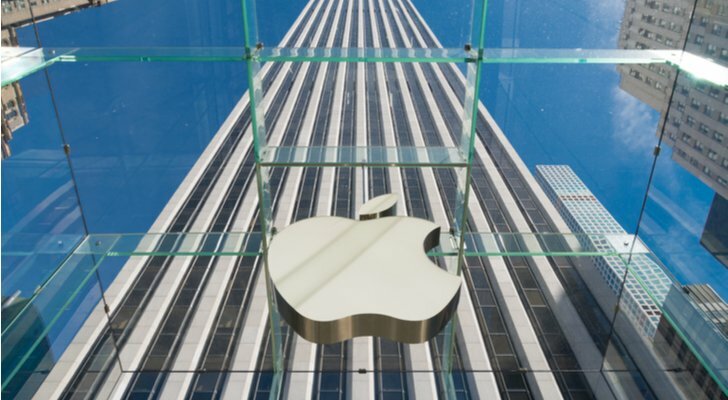 It’s been a bumpy year so far for tech giant Apple Inc. (NASDAQ:AAPL), but the company’s volatility has actually provided a few great entry points for savvy investors looking for stocks to hold for the long term. Apple stock was hurt by worries about lackluster iPhone sales and the overall market’s decline, but those setbacks are likely to be short-lived for AAPL investors. Therefore, it makes sense to use pullbacks as an opportunity to pick up shares of a solid company with a loyal following. One of the best parts of investing in Apple stock is the fact that the company has a relatively wide moat — something that’s hard to come by in the tech space. Apple has found a way to create an ecosystem that’s hard to give up, and that gives the firm pricing power and a boatload of future security. Apple followers are loyal, and once you dip a toe into the world of AAPL products, it becomes easier and easier to continue buying them because they all work together. Take wearables for example. The Apple Watch has been touted as the best smartwatch on the market, both for fitness tracking and otherwise. However, you’ve got to be part of the Apple ecosystem in order to enjoy its benefits. The iPhone X has received a lot of praise as well for its cutting edge technology and superior camera. Apple is associated with good quality, so people are likely to buy into the ecosystem as a whole because they believe they’re getting more for what they pay for. A huge concern for AAPL has been iPhone sales and whether the company can continue as the growth engine investors have become accustomed to. The answer to that one isn’t simple. Apple is a much more mature company than it was 10 years ago, so its growth isn’t going to be as aggressive as it once was. With that said, there’s still a huge runway in the future. Not only is Apple making major strides into the wearables space with its watch, but the company is growing its services arm at an impressive rate. Subscription fees are becoming a major revenue driver for Apple. The company is now offering everything from cloud storage to a music-streaming platform that users can pay for monthly. While iPhones sales still make up the majority of the firm’s revenue, services comes in at second now, and that figure is still growing. Last quarter Apple said its services arm saw an 18% increase from the previous year. Another reason to love Apple is that the company is a profit engine. The firm has always had impressive margins, but ramping up its services arm should help that figure along even further. Subscription services are remarkably cheap to deliver, making those monthly fees a huge profit driver for Apple. As that segment continues to grow, we can expect to see Apple’s profitability rise even further alongside it. Apple has also been an investor favorite because management has proven to be extremely shareholder friendly in the past. The company’s mountains of cash make its dividend payments extremely safe, and most are expecting to see the firm’s 1.48% dividend yield rise in the coming year. Apple benefited massively from new tax laws that allow companies to bring their overseas cash back to the States for a much lower tax rate, and those savings are likely to be passed on to shareholders. Most are expecting 2018 to hold dividend hikes as well as share buybacks that will reward investors for waiting out the turbulence. Apple stock is a solid long-term bet not only for its growth prospects, but because of management’s willingness to give back to shareholders. The company’s bumpy ride in recent months means that its share price doesn’t fully reflect its potential. AAPL’s current share price means the company trades at just shy of 15 times its forecasted earnings. That’s much lower than the industry average of 19.28 and even comes in below the broader market’s 16.6 times forward earnings, and that figure is near all-time lows. My colleague Luke Lango says AAPL stock needs to dip below $160 before it becomes a compelling buy, and while it might be true that the stock will see more volatility before getting back on track, I believe AAPL stock is a great long-term stock even at its current levels. It’s not unreasonable to expect Apple to make it to the $200 mark before the year is over, which would represent nearly 15% upside. As of this writing, Laura Hoy was long AAPL. Article printed from InvestorPlace Media, https://investorplace.com/2018/04/apple-stock-is-still-one-of-the-best-long-term-picks-out-there/.